Soft Circle French-Bread フランスパン is best known for their hit doujin fighting game “Melty Blood” with their latest iteration “Melty Blood: Actress Again Current Code” being released in 2010. 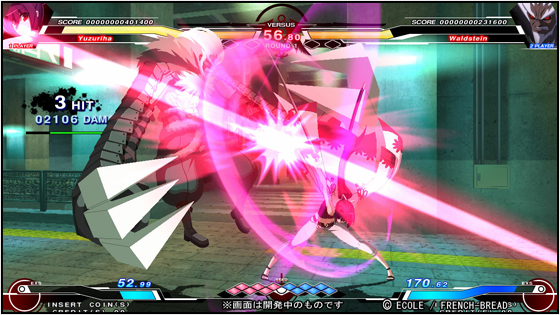 However, seems they wanted something bigger and better it would seem by deciding to create an entirely new game that could compete in the same genre as all the other HD fighters utilizing the current gen technology; thus, Under Night In-Birth (アンダーナイト インヴァース) was born. In this article I am going to attempt to cover everything I know so far; from system mechanics and character archetypes, to background details and musical ambiance, to how I feel this game is shaping up in its totality as a fighter. Hearing about this game I was confused at first since I was sure the next game we got would be a beefed up version of Melty Blood from Soft-Circle French Bread, but instead they announced Under Night In-Birth (Which is pronounced “Under Night Inverse” apparently? ), which appears to be something similar to how Arc System Works went from Guilty Gear to BlazBlue rather than giving Guilty Gear an HD remake. From first glance at this trailer, you can tell it is a HD fighter like many others in this genre, that and it, just like Melty Blood, has a very ridiculous name with seemingly no meaning whatsoever (Including the text at the bottom which reads “Thousand night. Recurrence night. Reverie and invite. and… [7days immortal] Unreal BLACK THINGS.” Though this could have something to do with the story in itself, or possibly hint at an upcoming anime, since Shiki Tohno and Arcueid Brunestud from Melty Blood came from the manga “Lunar Legend: Tsukihime” which title was “Blue Blue Glass Moon, Under the Crimson Air“.). 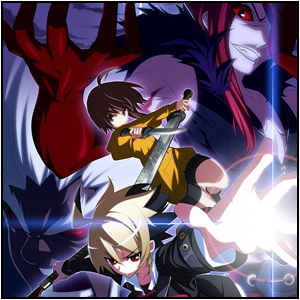 You can tell this game will have uniquely original characters; from this trailer you seen Linne, Hyde, Carmine, and Waldstein. Linne seems like a fast paced rush-down character, Hyde seems like your basic all around “hero” t ype of character, Carmine looks like the insane blood-wielding character, and Waldstein is your basic, overpowering grapple type. One thing I knew was that I had already set my eyes on Linne just from the trailers because she uses duel swords and has small statue, while someone like my friend, Raikugen, may prefer Waldstein because he is large, slow, and incredibly powerful looking. Just from this trailer I was hype and intrigued to learn more about this game and what it would come to be in the future, so, I did further research and will bring to you what I know in the following paragraphs. When dealing with games of this nature from companies that have already made a previous fighting game, often times they tend to try and capitalize off the popularity and style that the previous game or franchise has brought to the table. Often times when switching to a new game, companies will keep what fans liked and the most popular characters’ style in order to try to keep things familiar enough to transition into what the game truly is (Think about Ragna of BlazBlue and Sol Bad-Guy from Guilty Gear, or Remy of Street Fighter III: Third Strike and Guile from Street Fighter II). However, from the characters I have seen game play from so far (Hyde, Linne, Waldstein, Carmine, Orie, and Gordeau) I have not seen any repetitive character styles from Melty Blood. Which is a very good thing. Production of this game is rumored to have started after the release of Melty Bloody: Actress Again Current Code. We know this game is going to be High Definition with 1280×720 resolution, making for a screen ratio of 16:9 with a probable release date sometime in fall 2012 for Arcade on the Sega RingEdge system. As far as system mechanics go, we know it is going to be a four button fighter, which how Melty Blood is a 4 button fighter. When being combo’d you can rapidly press buttons in order to reduce the damage, just like in Melty Blood (But be careful not to mash your way into a “reset”). Also unique to the game is the type of things that alter the state of your characters and the way your combos and power flow. EXS: This is basically your super bar. In order to perform a super it costs 100 EXS. GRD: This enhances your attack and defense as it increases. Shield: Pushes the opponent back (Reminds me of Barrier Block from BlazBlue), I believe this consumes EXS. Assault: Command Dash that can be attacked from and uses a certain amount of EXS (No idea if it has invincibility properties or not). Concentration: Charges up your EXS, reminds me of the charge from certain SNK games. 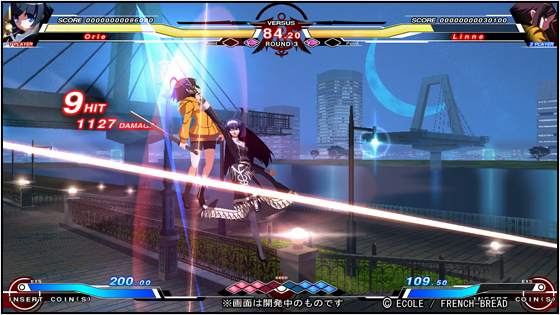 Veil Off: Similar to heat from Melty Blood, increases power and blows back the opponent. Infinite Worth: Costs 200 EXS and is the strongest move a character possesses, think of this as a Super Desperation Move from The King of Fighters games, or, in a sense, a NEO MAX move. Before the match they give a description for each character, which does not make much sense. Such as in this video of Orie vs Ordeau. For Orie they say: “Her ability is the ability to recall a magic doll for which the “pure embodiment” she imagines is enough. The innocent barrel defence person who doesn’t know tainting is a girl friend, I hope and don’t permit all intervention to a request“, and do something similar for Ordeau, which also does not make any sense at first glance but could make sense later on if there is a story mode or an anime. For the entrance before they fight, there is talking just like in Guilty Gear, “Heaven or Hell, Duel 1, Let’s Rock!” or BlazBlue, “The Wheel of Fate is Turning, Rebel 1, Action!“. However, in this game, there is additional text underneath what they say. Recurring VOID Effect…(Well, the origin of a hopeless time. I wish my life with the wish, obligationand prepare for strife with an enemy). DIVIDE! (kill each other, but it’s good “INVERSES”). This game has the ability to bring more doujin games to the forefront. As we can see by the Evolution 2012 World Series of Fighting Games Tournament line-up, no anime-esque or doujin-type fighting games are here this year. With all the games that could have been, (Skull Girls, Aquapazza, Melty Blood, BlazBlue, Arcana Heart, etc.) nothing made it in and it shows the lack of mainstream support for these type of titles regardless of the cult-like following it may have from small gaming circles. I think that the reason behind it was not enough rallied support of the communities and the companies themselves not getting involved enough with the competitive players and the competitive side in general with their gaming; another thing is simply the game play behind a lot of the doujin games which are being rendered as “Non-competitive” or “Not serious enough” by most high-level players of other video game franchises. As I said, the company’s direct involvement with their game can insure success. Give sponsorships to the top players within a game, add money to a tournament in order to draw in larger crowds and get your game more exposed for the world to see (Certainly worked for Mortal Kombat) and if you have to, find a way to get it into big tournaments that everyone around the world attends, such as Evolution and Super Battle Opera. Listen to them with game updates, make forums and communities easily accessible, and find good tournament people to be the “face” of your video game, have a robust online and good marketing strategy to try and keep people around as long as possible to bring your games true potential into fruition. I feel that Melty Blood, Soft Circle French-Bread’s previous fighter before Under Night In-Birth did not catch on so well because of how they handled the online and promotion aspects of their game. Melty Blood: Actress Again Current Code should have had a modern release for platform consoles: Xbox 360 and Playstation 3, at least if not in disc format, the on Xbox Live Arcade and Playstation Network; if they want this game to fully survive to some extent, I suggest they bring UNIB to consoles after it is released in arcades during a reasonable period of time. I believe that Arc System Works will release a Guilty Gear X3, and are currently going to release Guilty Gear: Accent Core on PSN and XBL for the simple reason of promoting the game before hand, something that Soft Circle French-Bread could learn from. Something else that is relatively big, which could be bigger than everything put together, is the game play and hype surrounding the game. BlazBlue was seemingly more balanced than Street Fighter IV when it first came out (At least BlazBlue: CS II was), yet it did not earn much respect from seemingly “lacking depth”; basically, everyone had the ability to Air Dash (Except Iron Tager), the ability to Dash (Except Iron Tager), and everyone had an overhead of some kind, basically, everyone had too many tools so it appeared as everyone was rushing in mindlessly to get some type of hit in, people did not find this fun at all; compared to Street Fighter where characters had disadvantages and advantages and some characters had a lot of tools while some had barely any (Dan), and people found these matches exciting. I just hope this game has enough depth and excitement in how the game handles things in order to gain the respect and admiration of the fighting game community. 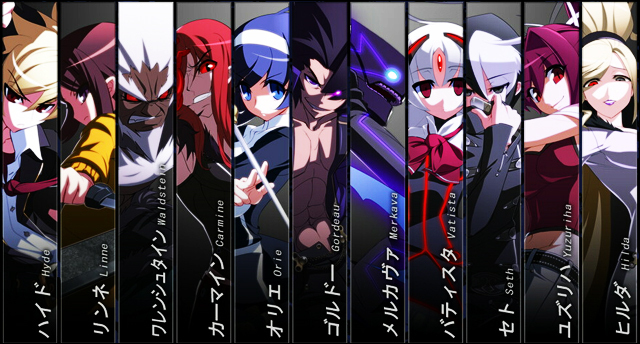 Hyde, Linne, Waldstein, Carmine, Orie, Gordeau, Merkava, Vatista, Seth, Yuzuriha, and Hilda. Under Night In-Birth is shaping up to be one of the best-looking doujin fighters to come out in a while, interesting character concepts that are on a unique-level that rivals BlazBlue, and seems to already have the support of many who are fans of their Melty Blood franchise. In order to survive, I suggest that they watch what they do in forms of advertisement and make this a console release later down the line and not “Just for Arcade and PC” if they want longevity for this series, especially if they plan for it to be a replacement for Melty Blood in some fashion, which means getting more involvement in the states and providing an English website instead of just their Japanese One. I have high hopes for this game and look forward to their future progress. Below, I’ll leave you with a few links to help you get started with info about Under Night In-Birth if you want to watch some match videos or want to just gather information for later on. Thank you for reading. Sayonara! Under Night In-Birth YouTube Channel. hmmm where can i download this game ?